I’m going to begin this review by answering a question that I’m sure that a lot of you have had on your minds when it comes to this game; no, Yoshi’s Crafted World is not the “true” Yoshi’s Island sequel that we’ve been looking for. I’m not sure that we’re ever going to get that at this point, actually. And, yes, it’s disappointing, but it is what it is, I suppose. Now that we’ve gotten that out of the way, let’s focus on the positive aspects of this game — something which shouldn’t be too difficult because this title has a lot of good things going for it. Yoshi’s Crafted World is, without a doubt, one of the most endearing games that I’ve played in a long while. It’s cute, it’s fun, and it’s very good at making you smile. As strange as it sounds, it almost feels like more than a game — it’s an “experience”, so to speak. And I don’t mean that in a pretentious way, either. This is a game that looks like it was literally taken straight out of the imagination of a child, and it’s hard not to feel like a kid yourself when you’re playing this. Everything about this game exudes such a playful air that makes it all but impossible not to get swept away, at least a tiny bit, by the whimsy of it all throughout the entirety of the game. 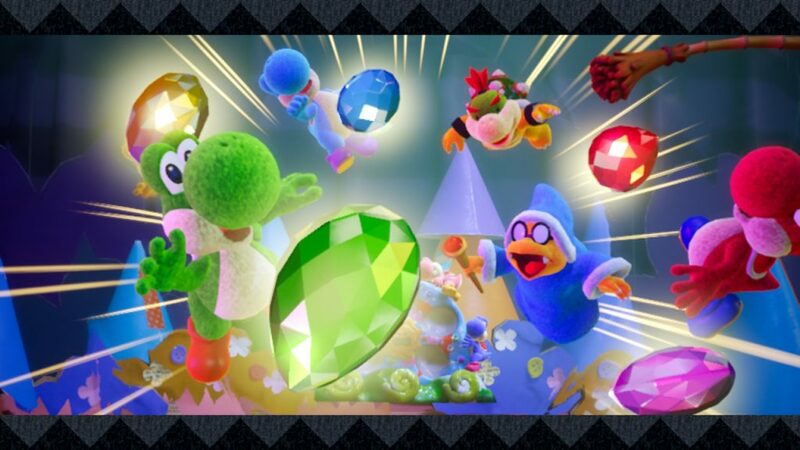 Yoshi’s Crafted World begins, as Yoshi games are wont to, with all of the Yoshi’s hanging out together without a care in the world — this time gathered around the wish-granting Sundream Stone. While their day begins well enough, things soon take a turn for the worst when Kamek and Baby Bowser appear, demanding that the Sundream Stone now belongs to them. Not wanting to hand over such a powerful item to such an evil pair, the Yoshi’s fight back with all of their might and, surprisingly, actually succeed! …Sort of. Rather than losing to the Koopa combo, the Yoshis’ scuffle leads to the Sundream Stone’s five gems — which grant it its power — popping out and flying all over the world. Thus the Yoshis, wanting to fix the stone, rush off to claim the gems before their shelled adversaries can. There isn’t really much more to Yoshi’s Crafted World‘s story than the intro and a few tiny cutscenes scattered throughout the game (mostly right before boss fights), but a game like this doesn’t really need a narrative. What is there is more than enough to serve as a story for a standard Yoshi platformer, and the conversations between the Yoshis and Kamek and Baby Bowser (well, it’s mostly the Yoshi’s just getting yelled at) are warmly humorous — a perfect finishing touch to the rest of the game. It’s impossible not to get drawn into this game’s visuals. 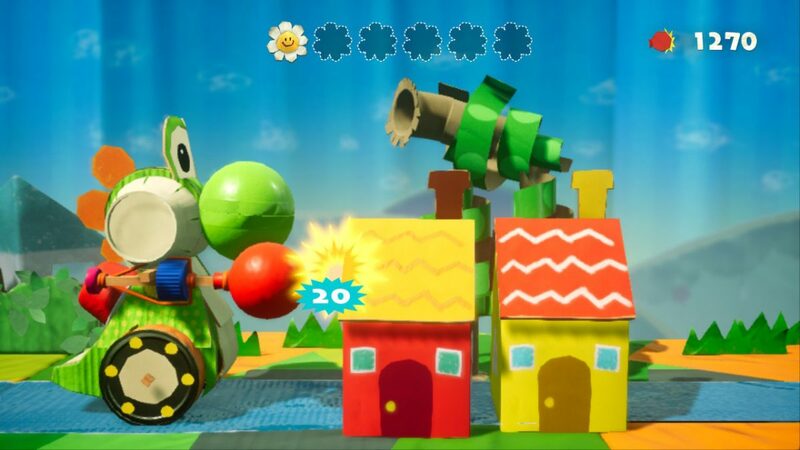 When it comes down to it, there’s really no single other Yoshi game that you can fully compare Yoshi’s Crafted World to. That’s not to say that it’s entirely different. It does, of course, follow most of the traditional Yoshi mechanics which have been in place since the beginning — throwing eggs, nabbing collectibles, and so on — but, outside of basic platforming mechanics, this game does a wonderful job with standing out all on its own. And, not surprisingly, a majority of this is due to its presentation. As I’m sure you’re well aware of by now, Yoshi’s Crafted World is highly stylized. No, it’s not the first Yoshi game to do this — that was Yoshi’s Wooly World. But, while a lot of Wooly World just felt like a standard Yoshi game with a new (and appealing) coat of graphical paint slapped onto it, Crafted World makes you feel like you’re guiding your Yoshi through a series of dioramas that a bunch of (admittedly gifted) elementary-schoolers put together for some kind of presentation. It’s this childish presentation (which I mean with all due respect), then, that guides a majority of how the levels work out. 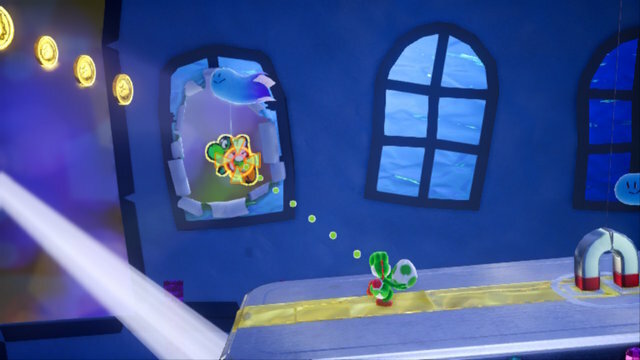 Rather than barreling through a level, nabbing as many collectibles as you can, Crafted World constantly places gimmicks and elaborate setups which, while not challenging, essentially force the player to take in their surroundings — and even lets players be a part of them, thanks to the inclusion of costumes. And, oh, what wonderful surroundings they are! Coming Soon: Yoshi: Planet Robobot! 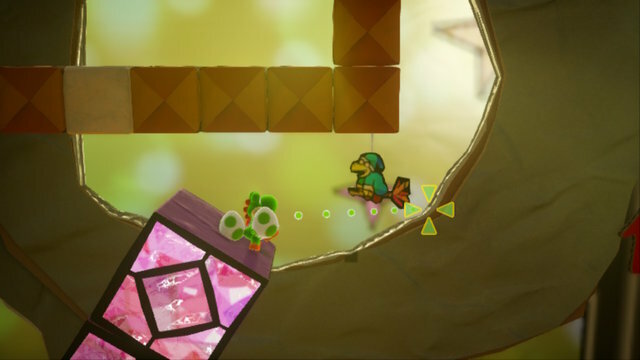 Yoshi’s Crafted World also has a few levels scattered about whose gimmicks are so all-encompassing that they essentially turn the level into its own unique mini-game. 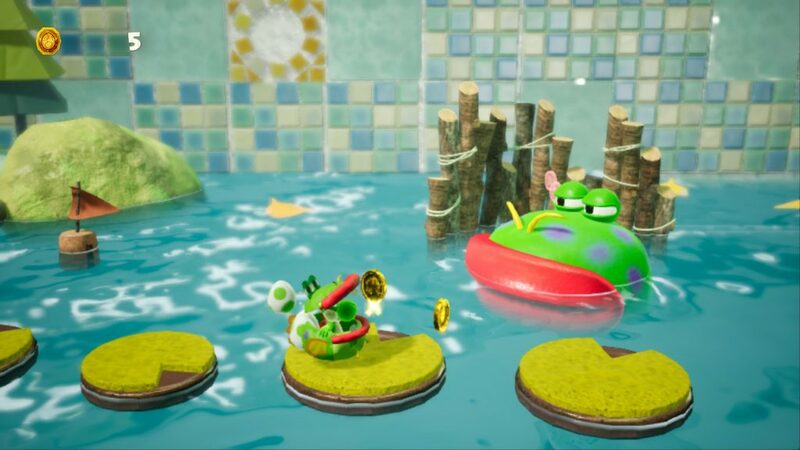 From piloting a mech to going on a jungle safari, to participating in a race, Crafted World‘s “mini-game levels” are an absolute blast to play. Seriously, there wasn’t a single one that I didn’t like. On top of this, the game also does very well with spreading them out. You’ll end up playing through so may normal levels that you just start to forget about the cool gimmicky ones when, *bam*, you’re hit (in the best way possible) with a new one. While still levels, and are therefore necessary to complete, each of these special courses feels more like a reward than anything else — an absolute best-case scenario, if you ask me. Sadly, there’s also a bit of a drawback to Crafted World’s aesthetics. 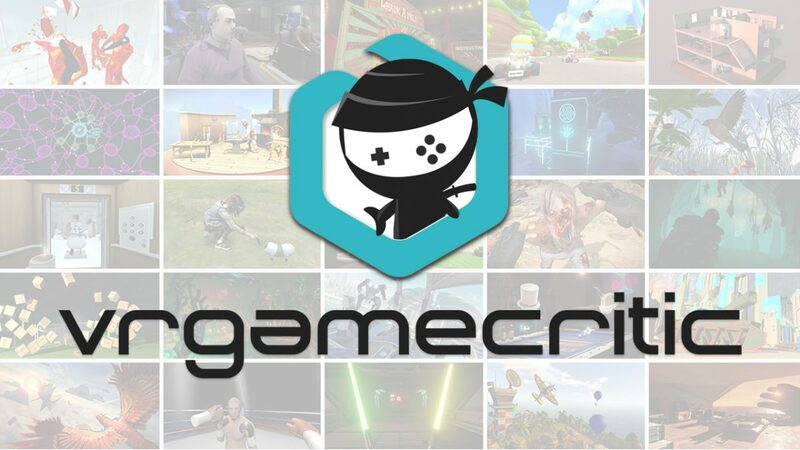 This game’s many playful gimmicks and artistic flourishes, enrapturing though they may be, come at the cost of the game’s ability to challenge the player. Basically, the game’s pretty but way too easy. Now, here’s where I could potentially fall into a Yoshi’s Island-shaped pitfall. I’ll be honest; I spent a lot of my time internally comparing this game to Yoshi’s Island while I was playing Crafted World, much of which basically consisted of me thinking “well, Yoshi’s Island didn’t do it this way.” And I’ve come to realize that that’s not fair. I shouldn’t expect this game to be any kind of clone, and I’ve grown to appreciate it for what it is. Do you… do you think he knows that I’m not a Lunge Fish? I do, however, wish that Crafted World would have taken a page out of Yoshi’s Island‘s book when it came to difficulty. Aside from the very last world — which was actually somewhat challenging — the entirety of this game is way too easy. I mean, you don’t even die if you fall off of a cliff. I get that this game was designed for players of all ages — and that includes children — but I don’t think that they need to be coddled this much. 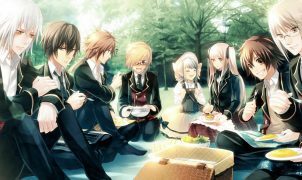 Even the game’s post-game world, incredibly enjoyable though it was, was a trite too simple for my taste. I’m not asking for something ridiculous, in terms of challenge. Maybe something that starts out as a 1 out of 10, and ends somewhere around a 6. But when you take an entire game just to go from a 1 to a 3, then you leave something to be desired. 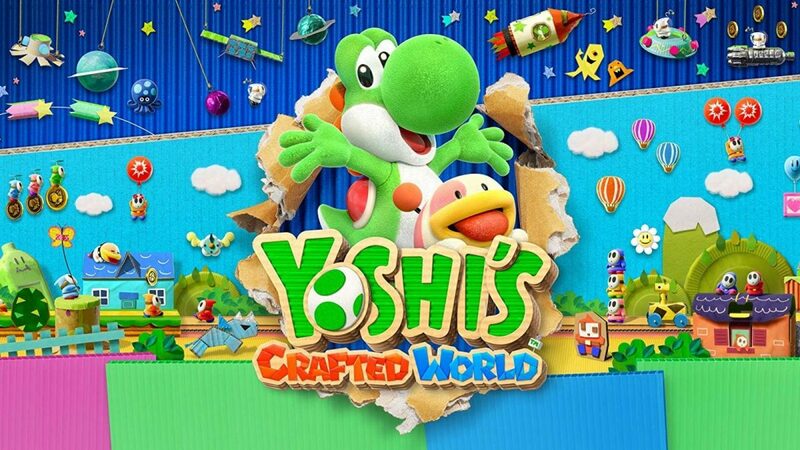 If this game hadn’t been titled Yoshi’s Crafted World then I’m sure that it would have been called Yoshi’s Repetitive World, because boy does this game love making players play through the same levels multiple times. 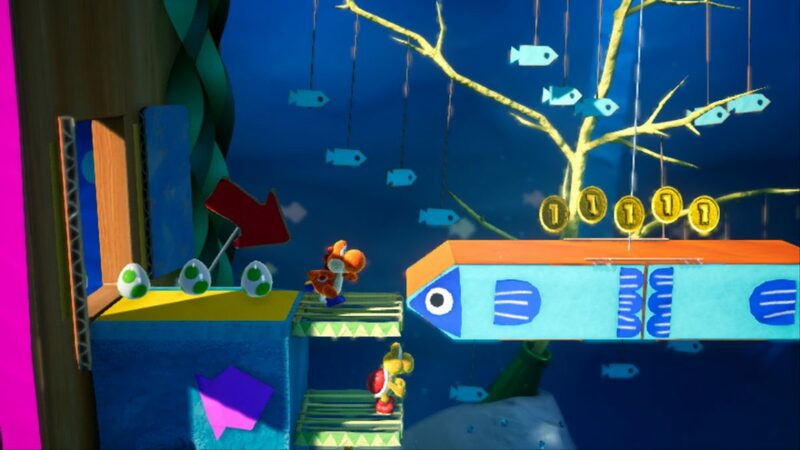 The main way that this repetition is enacted is through what the game calls “flip side” levels, which, as the name implies, are literally the levels in reverse. “What’s the catch”, you ask? Well, you aren’t necessarily going to be playing these levels in the same way that you did in their original form. 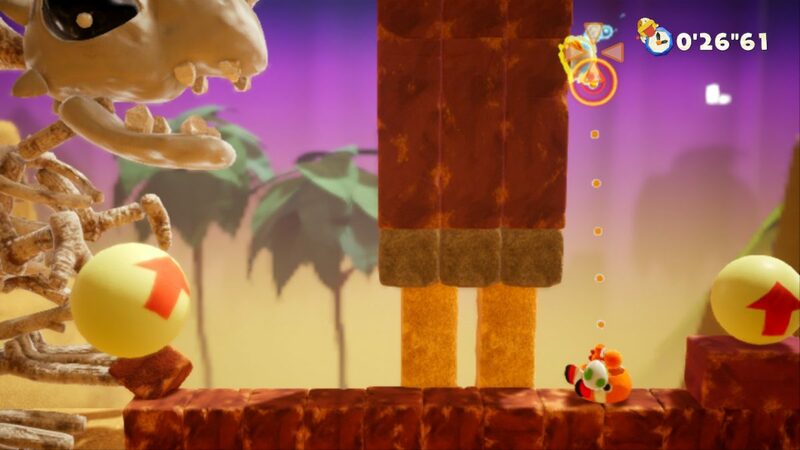 Serving as a literal opposite from their front-side counterparts, flip side levels are all about finding hidden Poochy pups (there are three per level), and making it to the goal within a certain time limit. Now, time trials aren’t normally my thing. Fortunately, flip side levels are almost always very generous when it comes to their clear times. Because of this, you shouldn’t have too much trouble making it to the goal after finding your pups in peril… if you can find them at all, that is. The other way in which this game will have you repeating levels is through craft scavenger hunts. Within each world is a denizen known as a Blockafeller, and it’s these guys who open up new worlds for you. After completing a world, however, that world’s respective Blockafeller will begin asking you to hunt down crafts for them. Normally acting as background and foreground elements, crafts are specific objects — ranging anywhere from bucket crabs to tin foil UFOs — that players must locate and mark by throwing an egg. On its own, this scavenger hunt mechanic is a neat concept. Where Crafted World goes awry, however, it’s with its overuse of it. Depending on the world, you could end up visiting a single level two or three times to collect different crafts, or perhaps even more if you can’t manage to locate it (which will almost certainly happen). I don’t think that scavenger hunts should be taken out, as they’re a lot of fun. However, maybe it would have behooved Good-Feel a little more to focus less on finding collectibles and more on creating new (and perhaps more challenging) levels for players to enjoy. Yoshi’s Crafted World may not be the Yoshi’s Island sequel that we’re looking for (sorry, I should stop saying that), but that doesn’t mean that it isn’t worth playing. Yoshi’s Crafted World is truly an enjoyable game thanks to the wonderful and carefully crafted world that Good-Feel has made, and I think that any pre-existing Yoshi fan would find it worth their while to pick this title up. After all, that Sundream Stone isn’t going to save itself! Full disclosure: This review is based on a copy of Yoshi’s Crafted World purchased by the reviewer.